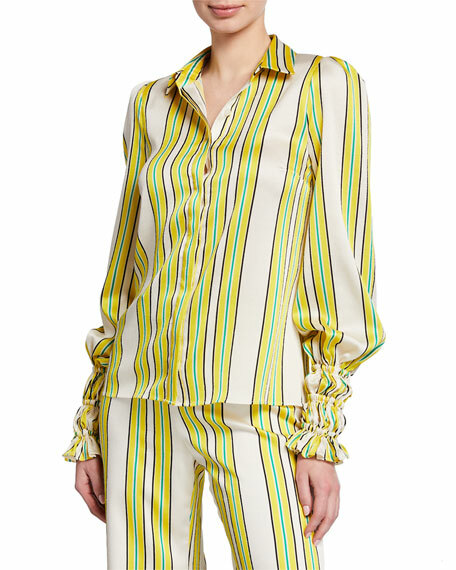 Asceno pajama top with bold side stripes. For in-store inquiries, use sku #2510212. A.L.C. "Noreen" striped top. V neckline; notched lapels. Concealed button front. Long sleeves. Relaxed fit. Straight hem. Silk. Dry clean. Imported. 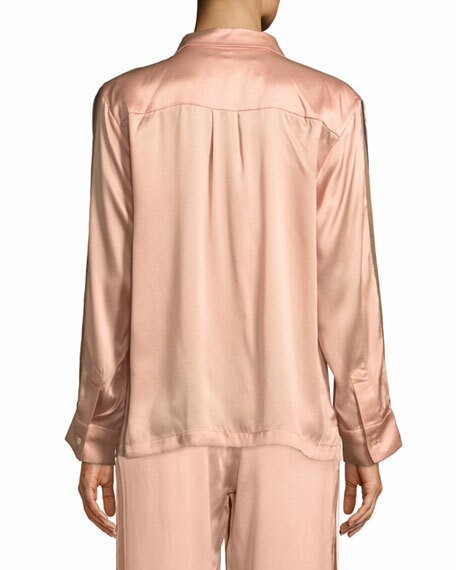 Model's measurements: Height 5'11"/180cm, bust 32"/81cm, waist 24"/61cm, hips 35"/89cm, dress size US 2. 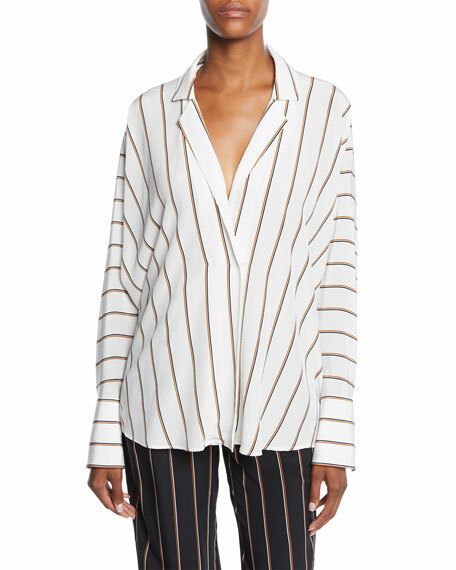 Alexis "Catina" striped satin top. Spread collar; hidden button front. Long sleeves; smocked cuffs. Semi-fitted silhouette. Straight hem. Polyester. Polyester/spandex lining. Dry clean. Imported. 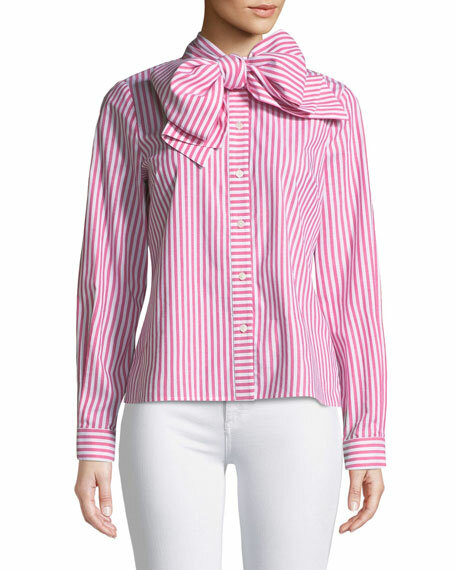 Badgley Mischka Collection blouse in candy stripes. Bow-tie collar; button front. Long sleeves; button cuffs. Yoked back shoulders; box pleat. Semi-fitted silhouette. Straight hem. Cotton/spandex. Imported. 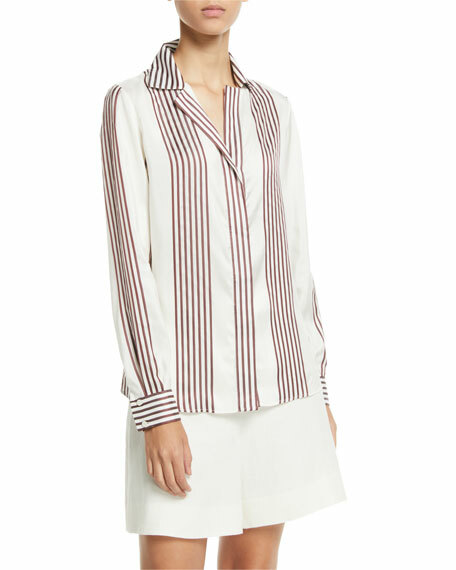 Loro Piana striped blouse in silk. Notched collar; hidden button front. Long sleeves; two-button cuffs. Yoked back shoulders; box pleat. Semi-fitted silhouette. Straight hem. Silk. Made in Italy.